Performing pujas is a vital part of monastery life. The prayers and dedications of those keeping pure vows, monastic vows, are considerable, and so when a lay practitioner needs help when someone is dying, is sick, or has obstacles in their practice/daily life, the Sangha are very pleased to perform pujas to help. The monks at Nalanda receive requests, mostly by email, to perform a puja for a specific person, family or animal. 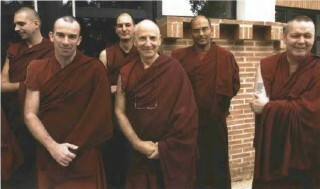 The person requesting usually offers a donation which is given to the monks performing the puja. The monks meet in the evening to recite the puja and offer strong dedications for the benefactor and their particular obstacle. Our website www.nalanda-monastery.eu lists the pujas we recommend for different circumstances, together with a brief explanation of the different types of pujas performed at the monastery.